You don't have to draw to be an artist. Try my "5 EASY PIECES" - this is wonderful for children and adults alike. Go out outside and find 5 pieces of anything. Use the five pieces you find, laying them down on a large piece of paper, interweave them together and once you are satisfied glue it and see what you come up with. Launa Romoff has been working with collage/mixed media since 1997. She has been inspired by the work of Kurt Schwitters, regarded by most as the 20th Century master of collage. Ms. Romoff finds her material everywhere, because, by working in this medium, she believes you learn to "see" the beauty of the discarded and turn it into "art". 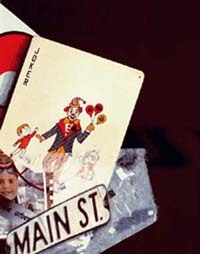 PS: This collage with the Joker, child's face and Main St. sign, from Ms Romoff is my favorite..